Kif Feels Old is a season 12 episode of Futurama. When Kif's childhood slips away, he starts to live in the Near Death Star. Before that, The Planet Express Crew, Zapp, LaBarbara, Leo, Inez, the Preacherbot, Robot Devil and others start to throw a fake funeral for Kif Kroker. Although, this episode aired after Jerry Nelson's death. After der credits roll, the white message says "In The Loving Memory of: Jerry Nelson (1934-2012)", so the Count makes an appearance then. After Kif comes back from work, he tells Zapp that He Is Your Co-Worker, in a Darth Vader accent. Kif's elderly apperance is like Yoda, but bigger, also, Yoda appears having a converation with Kif about how the started to feel old and heavy after work. When Kif Kroker just approaches the news, according to Linda, Mark Hamil aka Luke Skywalker has to go to the hospital for everything that is so crazy with his pancreas. The retirement place Kif lives at when he is old and heavy is the Near Death Star. C-3P0, Darth Vader and his henchmen, R2D2, Princes Leia, Jaba, Han Solo and The Wookie are seen attending Kif Kroker's funeral, and also make cameos during Mark Hamil's operation about his pancreas. Harrison Ford, who played Han Solo, was unavailable so, Phil LaMarr played him instead. Big Bird, Ernie, Bert, Cookie Monster, Fozzie, Waldolf and Stadler appear in Kif's funeral. During Kif's channel surfing scene to the News on TV, he switches on to an educational clip on TV showing The Count in his castle counting 8 coconuts. He Laughs, in a scary, ghoulish laugh instead of his trademark laugh. When Kif is at the supermarket, all of the main characters of the Simpsons make a cameo where Bart asks his family a comment about Kif and Homer forbids him and he, Bart and the others leave and they later appear at Kif Kroker's funeral. Mr. Burns and Grandpa are seen having a meeting with Kif about being 100 Years old while Smithers watches. In Kif's channel-surfing scene to the news on TV, A Clip from the Golden Girls, is seen on TV, with the stars as heads in jars. When Kif talks to himself, he mentions that fast-speeding hedgehog and his two-tailed fox buddy. Yoda: Meet You I Am Pleasured to. Like Me Why Do You Look? Kif: Because i was... uh... i...oh...was....um...about to start feeling old. That's Why! My Job was Zapp Brannigan's sidekick. (to Yoda) What was Your Job? Linda: You'd know that Mark Hamil, he was the star of the original Star Wars trilogy including the second film The Empire Strikes Back which he had been fighting the jedi, has suffered for medical insurance due to a heart attack and something very crazy going on with his pancrieos so he had to be in the hospital for a very few days, may the force be with you. Darth Vader: Hope some fans of ours have watched the first three Star Wars movies. Princess Leia: Me too, Mr. Vader. 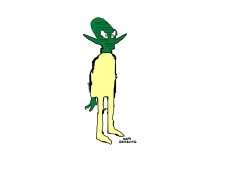 When Kif wakes up in the morning, his skin is a little light green. And when he looks in the mirror, he is back to his normal skin. Although Frida was seen, due to her prescense, it's possible that someone brings her back from being choked to death. This page was last edited on 14 January 2014, at 03:24.